We provide a wide range of Pallet Trucks, which are used to lift and shift a huge amount of bricks at a time. 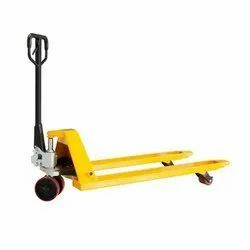 With high capacity of 500 Kgs, these Pallet Trucks are also integrated with 3 pneumatic wheels and a lifting system, which helps us in easy dragging. Our range of Pallet Trucks is extensively used in various industries such as cement, chemicals and fertilizers. Our clients can also avail from us the customization of these trucks as per their requirements.